Hilarious John Donne Star Trek Crossover! This is absolutely amazing! No idea who the guy who did this, but I love his sense of humor. Matt Staggs over at Enter the Octopus posted this today. He calls it his stupid question of the day, and it seemed so much fun to me that, in the spirit of his question, I just had to steal it from him. Stupid question for today: is memorizing a piece of literature piracy? I have a pretty liberal take on copyright laws, and sometimes it seems to me that trying to enforce many of them in the age of the internet is like trying to plug a hole in the Hoover Dam with chewing gum, in my opinion. There are just too many people out there with too many ways of sharing information now, and the market is going to change. The cat is already out of the bag. Along these lines, I have a stupid hypothetical question. Knowing that unlawfully copying another’s work is technically illegal, my question to you is this: is memorizing a work of literature technically piracy? I memorized a handful of poems by Edgar Allen Poe when I was a kid, and if pressed I could probably recite several of them even now. Maybe you did something similar.You’ve reproduced it, stored it in that big squishy flash drive between your ears. And now you can spread it to other people, simply by recalling it for recitation. So are you we pirates, technically? What about music? If you get a song stuck in your head do you owe the RIAA royalty fees? Maybe one day the corporations will invent some sort of mechanism through which our memories will come encoded like pay-per-view. What do you think? “She found the rifle standing on its stock in the back of his cluttered closet. and I was hooked. Ketchum will do that to you. His prose is so smooth, so straightforward and immediate, that you find yourself unable to look away from the page. One hour, and five stories later, I found myself unaware of where the time had gone, my skin damp with sweat. And then I remembered…that’s why I read Jack Ketchum. On the evening of July 12th, 2008, International Thriller Writers celebrated and announced the winners for its literary awards at a gala celebration at the Grand Hyatt in New York City.The SILVER BULLET AWARD for contributions to the advancement of literacy was presented to both Macy’s and to David Baldacci. 2008 ThrillerMaster Award for recognition of her illustrious body of work and many contributions to the field was granted to Sandra Brown. Congrats to all for their big wins, but especially to Tom Piccirilli and Joe Hill. Both books were fantastic and deserve the kudos. I am happy to announce that my novella, “Something Permanent,” was just picked up for an upcoming anthology called Pantechnicon. “Something Permanent” is the story of Philip “Bumper” Barker, a professional soldier who is in Cuba in 1933 fighting in the Sergeants’ Revolt. While walking along the beach with a beautiful young woman named Melena Palmira, Bumper finds a fishing boat that has been stretched and corkscrewed by forces he cannot even begin to understand. The boat belongs to Melena’s cousin, and when her father learns about the discovery, he forces Bumper to help him find his nephew. But what they find in an underwater cave proves to be more incredible than any of them could have imagined. There’s been a great deal of talk these past few years about Steampunk. Ann and Jeff VanderMeer just released a landmark anthology of steampunk stories, and the wonderful Ellen Datlow has another promising anthology of steampunk stories coming out soon. I enjoy steampunk. I find the incredible gadgets and the clothes and Victorian sci fi great fun. But it’s not what I like to write. So I figured what steampunk did for the Victorians, I would try to do for the expatriot generation of the 1930s. “Something Permanent” is my first entry into this new field. Hopefully, the story and the ideas behind it will resonate with the reading public. More on this anthology as it develops. T.E.D. Klein isn’t terribly prolific. He writes primarily in the novelette-novella length, and there aren’t many of those–certainly few that are still in print. But what there is deserves serious mention. He is capable of some truly amazing examples of characterization, and he uses humor and tension with equal aplomb. His novella “Children of the Kingdom” to this day ranks as one of my favorite horror stories. So too does his contribution to the Lovecraft Cthulhu cycle, “Black Man with a Horn,” which is what I spent some of my afternoon rereading. So this is what I was reduced to–a lifetime’s work shrugged off by some blurb-writer as “worthy of the Master himself,” the creations of my brain dismissed as mere pastiche. And the tales themselves, once singled out for such elaborate praise, were now simply–as if this were commendation enough–“Lovecraftian.” Ah, Howard, your triumph was complete the moment your name became an adjective. I’d suspected it for years, of course, but only with the past week’s conference had I been forced to acknowledge the fact that what mattered to the present generation was not my own body of work, but rather my association with Lovecraft. And even this was demeaned: after years of friendship and support, to be labeled–simply because I’d been younger–a mere “disciple.” It seemed too cruel a joke. This passage sets the tone for the whole story. The narrator is bitter, angry at life and fortune for slipping away through his fingers; but yet at the same time his friendship for Lovecraft is sincere. He is jealous, but honest with himself about where his talent stands in relation to Lovecraft’s. One cannot help but feel a sense of pity for the narrator–and that is the doorway through which Klein lets in the horror. As soon as you admit to yourself that you feel for this narrator, the rest of the story becomes a terrifying reality. One can also recognize Klein’s satire of Lovecraftian pastiches. Let’s face it, most of what’s out there is not very good. August Derleth has got some good stories. And there was an anthology a few years back called Children of Cthulhu that had some excellent stories in it (most notably Weston Ochse’s “A Spectacle of a Man,” Caitlain R. Keirnan’s “Nor the Demons Down Under the Sea,” Yvonne Navarro’s “Meet Me on the Other Side,” and James Van Pelt’s “The Invisible Empire”), but by and large, most Cthulhu fiction has the odious feel of fan fiction, and that’s just not a good thing. What separates “Black Man with a Horn” from the rest of the Lovecraftian fictive realm is the way it blends with the Cthulhu cycle. Most of what’s out there, in addition to being poorly written, has a tacked on feel. You get the sense that there’s nothing new here. It’s reductive. But “Black Man with a Horn” not only engages the body of Lovecraft’s work in a surprisingly subtle way, it also engages the man’s life and his well-known and, truth be told, distasteful, xenophobic tendencies. This is a zombie tale, no doubt about it. But it is also an unconventional approach to the genre. There are no menacing hordes to fight, no gore, no bloodshed. Gorehounds may be a little put off with that. Enough reviewers have spoken of the zombie renaissance of the past few years that I don’t need to go over that ground again. Suffice it to say that we’ve seen zombies in many permutations now. We’ve seen them as the backdrop for survival horror. We’ve seen them as metaphors for the social ills of modern America. We’ve seem them as comedy and agents of the apocalypse. But I guarantee you you have not seen zombies like the one in Orpheus and the Pearl. This is a quiet tale, but one that runs deep. Going through it, I found myself enjoying the story for its wonderful gothic elements. There are echoes of Jane Eyre and Frankenstein and Hawthorne’s “Rappaccini’s Daughter,” and yet it always retains its own clear voice. Paffenroth’s version of the madwoman in the attic is harrowing. It is a short book, and it is played by a small cast, but it is a big story. If you are a fan of the zombie genre, this is a must read because it takes you far afield of what you’ve read before. If you are a fan of the gothic, you will find yourself making wonderful new connections to old favorites. I loved this book. I bet you will too. One thing for sure, you will never hear the phrase “milk bath” again without thinking of a certain scene from this book. Another great thing about my recent trip to Los Angeles was meeting up with my good friend Mark Onspaugh and his lovely wife Tobey. They treated me to a wonderful night out, a fabulous dinner, and some of the best conversation I’ve had in a good long while. Can’t wait to see you guys again. I just got word that my short story, “The Sixth Mission,” was chosen for a new Best of anthology called Best New Tales of the Apocalypse, coming soon from Permuted Press. I’m really excited about this one. Permuted has been getting better and better over the last few years, and I’m honored to be a part of their family of writers. “The Sixth Mission” was first published as an Amazon Short back in 2007. It’s the story of five friends who have reunited for a funeral, only to discover that the secret they thought they had buried for good forty years earlier has come back. 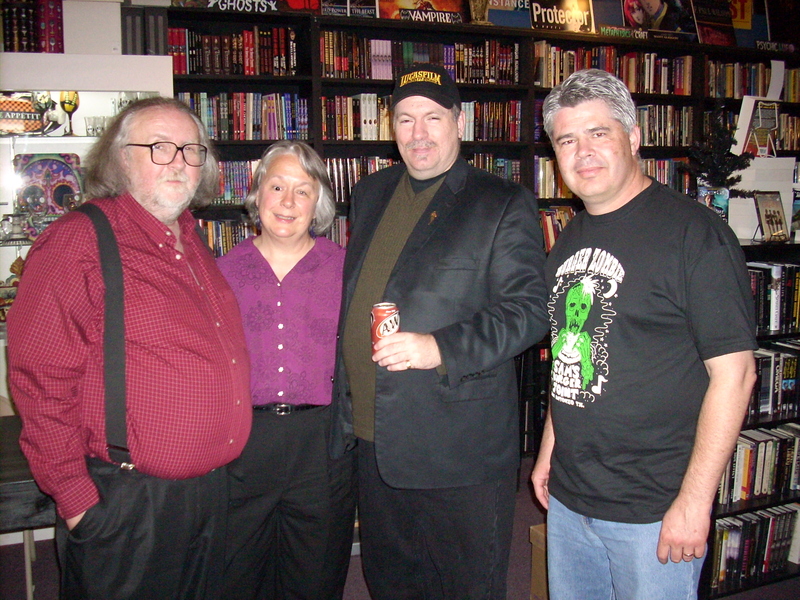 I just wanted to share some pictures from my book signing at Dark Delicacies back in May. In addition to meeting two of the best hosts a man could ask for in Del and Sue Howison, I got the rare privilege of visiting with Steve and Melanie Tem and Richard Dean Starr. Richard, as it turns out, is one of the coolest guys on the planet. We talked about his Kolchak series and his upcoming Tales of Zorro project, which I can’t wait to read. And the Tems were wonderful. I think my first comment to them was something stupid like, “Do the two of you have any idea how many of the books on my shelves at home have the two of you in them? !” Luckily for me, they are as gracious as they are talented. And then there were these two guys: Weston Ochse and Gene O’Neill. 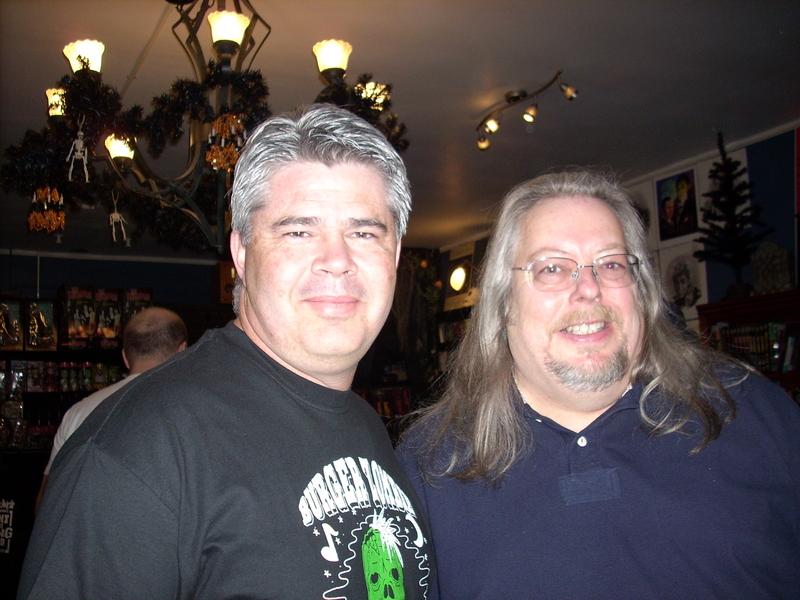 We met over margaritas at a little Mexican food place down the street from Dark Delicacies and had a great time. Gene is an ex-boxer and the author of a fantastic apocalyptic novella entitled The Confessions of St. Zach. We talked about boxing and about writing from life experiences, and I can tell you this now, there are very few authors out there who are more passionate about what they do and where they came from than Gene O’Neill. Meeting Weston Ochse was one the highlights of my trip to Los Angeles. 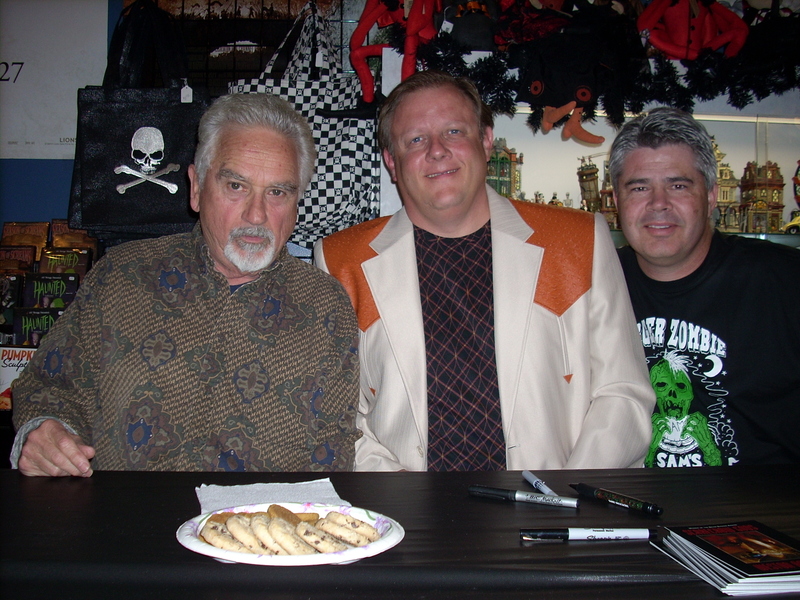 Weston is the author of the Bram Stoker Award-winning novel Scarecrow Gods and a self-professed Cowboy in the Boat of Ra. We traveled the floor of the Staple Center for two days during the Book Expo America 2008 show, meeting other authors and talking about life and writing, and I had a great time. Can’t wait to see all of you again.